Aviation manufacturing represents 18 percent of total manufacturing employment in Kansas. 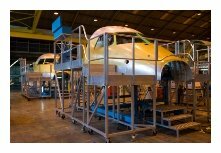 The Center for Economic Development and Business Research has released a report that provides an overview and analysis of the Kansas aviation manufacturing sector. The report discusses wages, employment, trends, occupations, productivity, research and development, as well as exports and imports.